The newly admitted students of Ghana Institute of Management and Public Administration (GIMPA) Public Sector Management Training Programme have been advised to learn hard and improve in quality service in the public sector. The students were challenged to eschew acts of indiscipline and effect positively the knowledge to be attained to improve competence in the governance of the public sector. Professor Anthony Mawuli Sallah, Dean of Student, GIMPA gave the advice at the 13th Cohort matriculation ceremony of 19 students from three West African countries to undertake a one-year Master of Public Sector Management Degree programme. Participants for the programme were drawn from Ghana, The Gambia, and Liberia, with background from public procurement, education, security, governance, local government, among others. The programme is a GIMPA initiative which started in January 2006, sponsored by the African Capacity Building Foundation (ACBF) after intensive selection procedures. 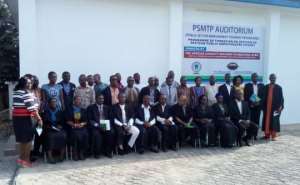 It is designed to equip Anglophone West Africa countries with a critical mass of public sector managers trained to provide effective leadership for meeting the developmental challenges in their various countries. Prof Sallah, also an Associate Professor said the role of government was critical in providing quality services to the citizenry, and as such it behoved on public servants to discharge their responsibilities in an effective and efficient manner to achieve that mandate. According to him, when government officials take wrong decisions, it affects the entire nation and cost huge sums of money, saying it was incumbent on them to build the capacity of public sector personnel to discharge its duty in a professional manner. He urged the students to harness and integrate their skills to be change agents in their respective countries and assured the students of the Institute's support and expected them to give out their utmost attention to their facilitators to the end of the course. Mr Julius Atikpui, the Secretary of the Institute urged the students to be humble and submit to authority to ensure the success of the programme. He admonished them to participate in all the class activities without failure since the certificates would be earned and not just given. Mr Gbanjah Campbell, the Class President of the programme, commended GIMPA for the friendly hospitality and pledged to heed to the rules of the institute. 'We expect to be provided with a stable learning environment and feedback on our performance to build us ahead', he added.